The lack of access to fresh, healthy and affordable food. The food dessert struggle is real. As a native Detroiter, I can tell you first hand of my experiences with friends and family members who are forced to travel 30 minutes or more just to buy fresh produce. Thankfully, they have access to reliable transportation and the resources necessary to afford healthier options. However, there are hundreds of thousands, if not millions, of African American women living in communities where fresh produce, lean cuts of meat and whole grain products are like unicorns – they’ve heard about em, seen pictures of em ’, but never actually SEEN one in real life. Thankfully there are a number of people heroes in our communities across the country doing what they can to help. Shout out to Wendell Price, Ron Finley and the hundreds of African American farmers, health coaches, and food justice advocates making it happen on the front lines. I work out everyday and I eat as clean as a rabbit in the wild but I STILL struggle to release this extra 10 pounds I gained during my pregnancy. Why? Because although I “feel” like I’m still 25 years old, I’m not. I’m knocking on 40 and while I’m enjoying the bi-product of certain hormonal shifts in one area of my life, (*wink*) the same shifts are are making it increasingly difficult to reach and maintain my weight loss goal. Hormones are the CEO of the body, they govern everything from our sexual desires and mood to the way our body processes the food we eat. Cortisol, Insulin Leptin, Estrogen and Progesterone are directly linked to hunger, appetite, and metabolism. When they’re out of whack there’s not enough discipline in the WORLD to prevent the late-night walk of shame from the bedroom to the kitchen. Luckily there are ways to control these hormones. Sleep, meditation, moderate exercise and learning how to say no when you’re feeling overwhelmed are helpful in balancing hormones and managing the negative effect of the next reasons. You wake up at 6am, shower, cook breakfast, get the kids up and ready for school. An hour later, you’re sitting in your little cubicle where you’ll be for the next 8 ½ hours busy putting out fires and dealing with co-workers and supervisors who seem to revel in their ability to drive you up a wall. Fast forward, it’s 5:30pm and you’re rushing out of the office desperate to make it to daycare on time. It’s 6:30pm, you’re dead tired but you have to cook dinner, wash the dishes, take out the trash, bathe the babies, put them to bed and if you’re lucky get 15 minutes to yourself. It’s 11pm and you crash exhausted. No wonder you’re fat. Aside from making unhealthy spur the moment food choices to help maintain your energy levels, the stress of having to take care of everyone first and yourself last never, certainly makes it difficult to resist those nasty little “emotional triggers” that force us to substitute food for what we really need (love, support, peace and quiet). The connection between obesity and sexual abuse was first brought to my attention during a Cocoa Mode interview with Sharon DuMas Pugh, founder of the Full & Fabulous program for overweight girls in Detroit. She mentioned that the majority of the girls in her program admitted to being victims of sexual abuse. 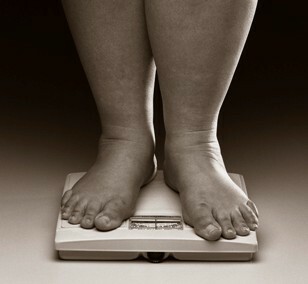 Since then, researchers have been exploring the connection and have found that girls who are sexually abused suffer from poor self-esteem, poor body image and impulsive behavior, all of which are common predicators of binge eating and obesity (source). In addition researchers have found that that children who have been abused tend to “de-sexualize” their bodies to protect against further abuse. Because mental health is not a priority in our community, many of these obese girls grow up to be obese women with the same fears, insecurities and poor eating habits. I don’t mention any of these to excuse or negate the importance of self-control, responsibility and proper life choices. I present this list as a reminder that life is often more complex than we’re comfortable admitting and that we are ALL responsible for the wellbeing of our children, wives, sisters, mothers and daughters. It’s easy to sit on the sideline and point fingers at the fat girl, but what good does that do? If you’re really interested in helping a sister – lace up your sneakers, and ask her to join you for a walk around the neighborhood. Talk to her, comfort her, inspire her to dig deep within her soul for the courage to change. Shawna Renee is a certified holistic health coach, yoga instructor, life coach and the founder of Feminine Art of Balance LLC. She is also the host of Cocoa Mode on SiriusXM Satellite Radio.